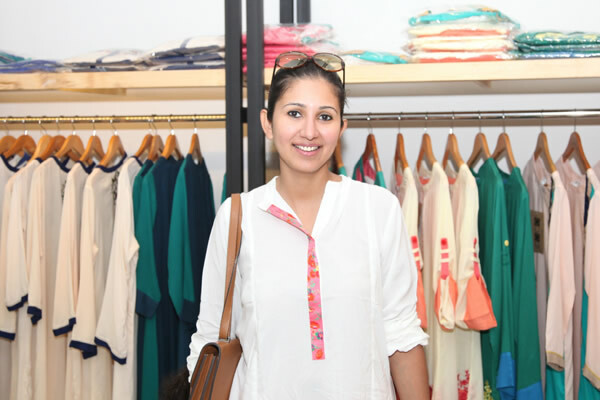 This month, FUCHSIA got to spend some time getting to know home-grown fashion designer Zara Shahjahan, who started off with a home-based set-up of tailors and machines, and is now a name you probably know if you know anything about Pakistani fashion. A graduate of National College of Arts (NCA), Lahore, Zara Shahjahan was one of 4 Pakistani designers to showcase their designs at the Lakme Fashion Week 2015, alongside seasoned names like Faiza Samee and Rizwana Bayg. Today, her traditional-yet-modern collections are a regular feature at the annual Pakistan Fashion Week. Although Zara Shahjahan’s field of study was Miniature Arts, she started designing clothes in NCA in 1999, and had her home set-up ready when she graduated in 2002. After a short stint with Hassan Sheheryar Yasin (HSY), Zara started up her own brand, with 2004 seeing the launch of her first standalone store. Although she didn’t follow up with Miniature Painting professionally, her training in it is reflected in her attention to minute detail and the intricacy of her designs. 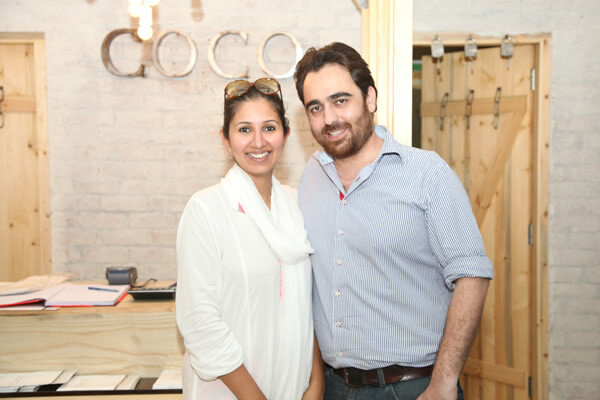 In 2010, her husband joined her in handling the technical side of the business, forming the husband-wife duo behind the successful brand Zara ShahJahan. FUCHSIA: Do you ever feel a degree in Fashion would have been more helpful? A professional degree cannot be replaced by anything except experience and that was the case with me. I had been designing clothes since I was in college, and that is what brought me where I am today. I had a keen eye for embellishments, research on fashion, prints etc, and that has been crucial for the success of my brand. However, we at Zara ShahJahan do always encourage professional talent because we feel that a degree polishes raw talent, and in today’s competitive age, one needs to strive to be the best. 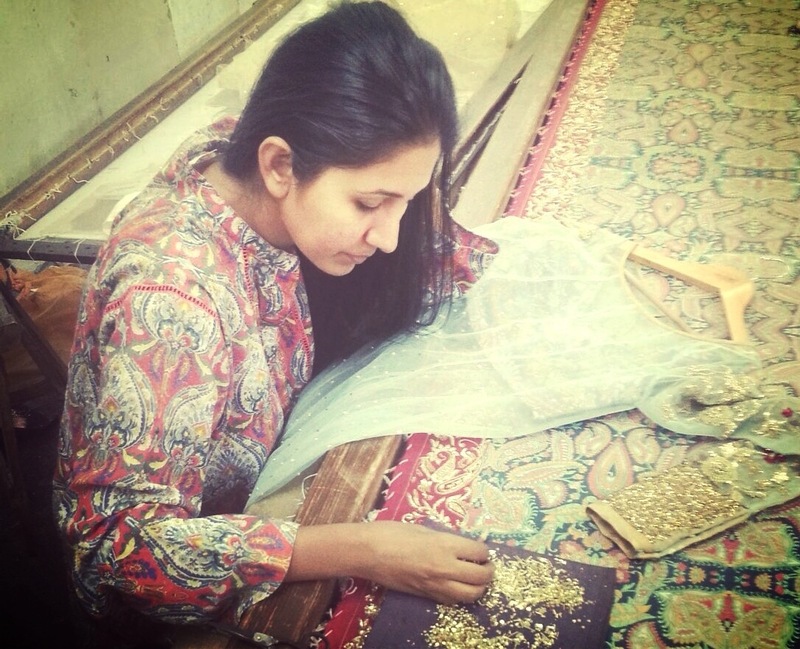 FUCHSIA: What is your influence on the working atmosphere at the Zara ShahJahan studio? I’m not a loner; I like people around me even when I’m working. My team is very core, they love working with me, and I like working with them. It’s encouraging to keep learning and sharing ideas, it inspires me, and it helps me come up with new ideas. I am a fun-loving people’s person, but also strict when it comes to work. FUCHSIA: Lawn is, after all, just lawn. 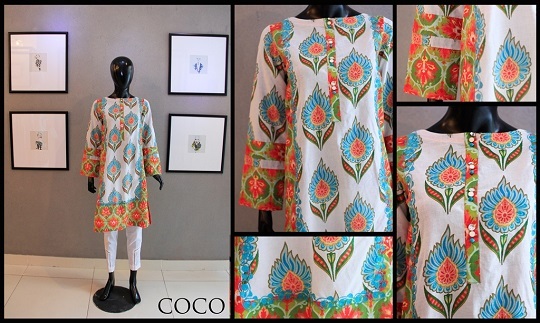 What makes a woman choose Zara ShahJahan lawn? The label’s debut lawn collection had been independently designed, produced and manufactured completely in-house at the new Zara ShahJahan production facility, and that is what sets us apart, along with our brand’s strong aesthetics and flair for print development. We have received immense appreciation for our innovation in prints, which included jungle prints and oriental-inspired prints, as well as for the intricate embroidery that comes with each outfit. The Zara ShahJahan lawn outfit is a complete ensemble which can be worn both to a formal dinner, and for a casual daytime outing. FUCHSIA: When will Pakistani designers do something for the working woman – something that’s chic, effortless, suitable for the workplace and within a reasonable price? 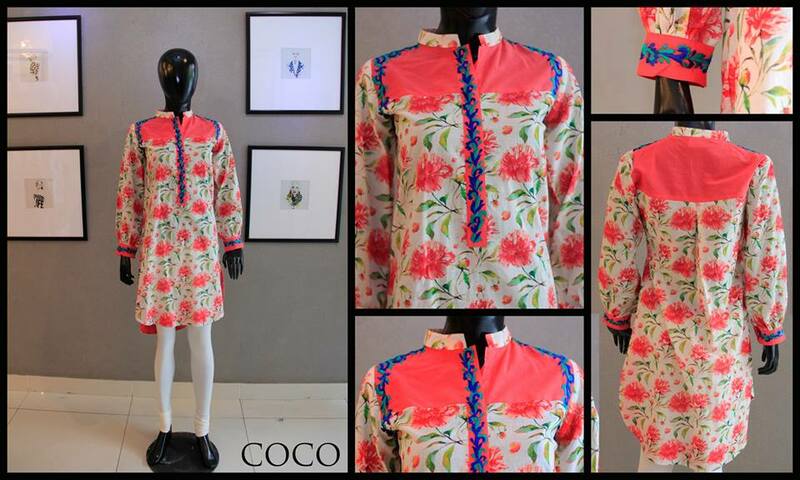 Our brainchild, COCO, incepted in 2012, is aimed precisely at this important and emerging segment of working women, young girls and females in general who want fun and quirky prints as smart, everyday casual wear. COCO’s distinct design philosophy adheres to simplicity in silhouettes as well as aesthetics. 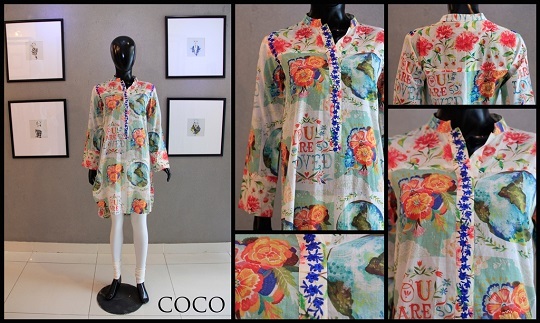 Known for its exciting digital prints, COCO is considered to be a fashion statement by the everyday woman looking for good quality and aesthetic appeal. 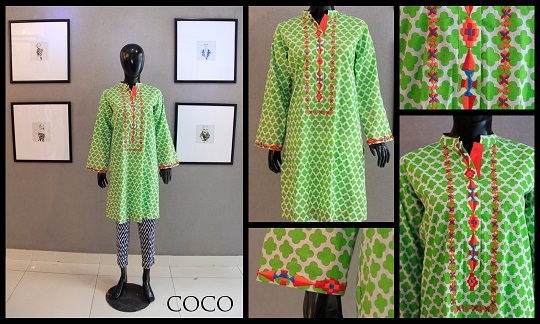 COCO is extremely budget-friendly with prices starting at PKR 2,400. Our western separates which are usually available off the rack at our stores include cropped tops, pants, jackets, skirts etc are for everyone. FUCHSIA: Vintage is great, but fusion is more universal. 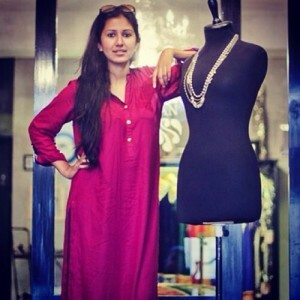 Are Zara ShahJahan creations planning to capture the global market? FUCHSIA: Every successful person has a story behind them. Some obstacle they faced. An inspiration. Some one who helped them. What’s your story ? My story is quite simple. I loved making my own clothes in college and received great appreciation from family and friends for making stuff that really stood out. Soon I was making clothes for family and friends for weddings, dholkis, parties etc. My mother inspired and guided me, and very soon Zara ShahJahan the brand was born. I started from home; very soon, a whole factory was in process due to high demand … and then there was no looking back. Now we have 2 standalone stores, 2 brands, a factory and design studio. We have been very lucky. FUCHSIA found Zara Shahjahan to be as Lahori as can be. Always out-and-about in the Lahore scene, she is present at every event and activity that matters. She seems to enjoy being the socialite that she is, and it shows in the strong relationships she has built within the industry. Surely, her practical and focused attitude which comes across in her demanour, is a large factor in the success of her brand. Don’t be surprised if you run into this no-frills celebrity at a casual café chilling with her good friends. We did!